All organisms use energy. Energy enters most ecosystems as sunlight and is converted into food by producers. This energy is transferred to each organism that eats a producer, and then to other organisms that feed on these consumers. 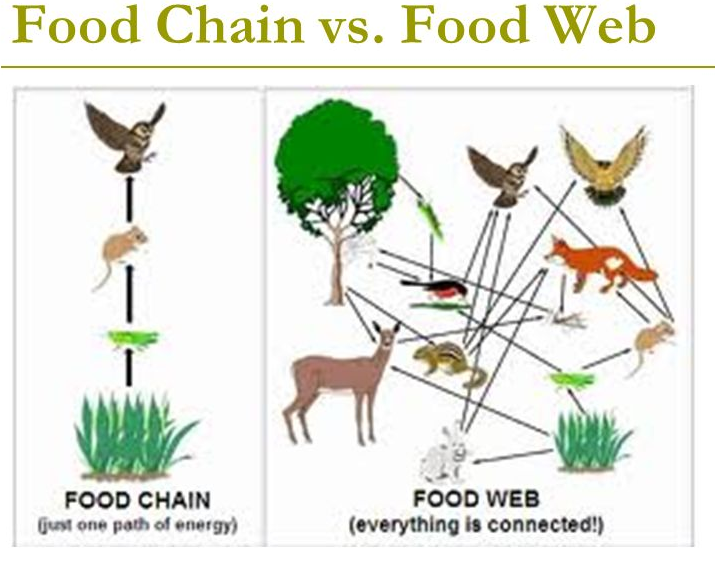 The movement of energy through an ecosystem can be shown in diagrams called food chains and food webs. A food chain shows only one possible path along which energy can move through an ecosystem. But just as you do not eat the same thing every day, neither do most other organisms. Most producers and consumers are part of many food chains. A more realistic way to show the flow of energy through an ecosystem is a food web. When an organism in an ecosystem eats, it obtains energy. The organism uses some of this energy to move, grow, reproduce, and carry out other life activities. This means that only some of the energy it obtains will be available to the next organism in the food web. The most energy is available at the producer level of the pyramid.